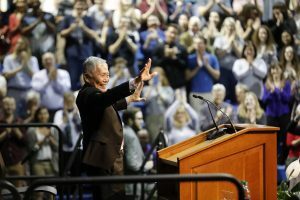 On Thursday, January 19, acclaimed Star Trek actor and social media monolith George Takei visited Rollins to speak about his experiences as an actor, a Japanese-American, and a vocal member of the LGBT+ community. His visit served as the fourth part of Winter Park Institute’s 2016-2017 series. Before his speech, he was kind enough to hold a Q&A session in the Bieberbach-Reid room, which I was honored to moderate. He spoke on many of the same topics, but his answers were especially geared toward the room of anxious and hopeful Rollins students looking for ways to make a positive impact in 2017. His spirited energy and captivating presence instantly put the room at ease, and the tangential nature of his answers brought about stories and laughter that felt like a conversation with old friends. Allie Furlong ’20 asked a question that was undoubtedly on everybody’s minds the night before Donald Trump was inaugurated as our 45th president: “How can we, as college students, make a positive impact on the world like you have?” His answer was at once satisfying and completely unexpected. He said that while the easiest answer was social media, and sharing thoughts and ideas with a mix of humor is always a good way to reach large numbers of people, we should not stop there. “We need people that are informed,” he said. He told us to go out into the community and find other people working to make change; he used interning for a political campaign as a personal example. At the end, he outlined the need for compassionate, dedicated politicians and urged students to run for public office to make real, lasting changes at the local, state, national, and global levels. Sadly, the Q&A lasted only an hour, but was bookended with selfies and autographs. His later session in the Warden Arena of the Alfond Sports Center was a much larger affair; lines spilled out of the building and into the parking lot as Winter Park Institute volunteers struggled to adapt to a new ticketing system. The event started slightly later than planned due to the confusion, but the audience did not seem to mind once Mr. Takei took the stage. Even so, he remained a closeted member of the LGBT+ community for over 30 years after his run on Star Trek ended. He was afraid to risk his career for the sake of being out, a fate he had seen happen to actor Tab Hunter when he was younger. A proud Californian, his moment finally arrived in 2005 when then-governor Arnold Schwarzenegger vetoed a gay marriage bill despite running on a platform of equality and acceptance. Saying “I had a good enough career. Maybe it’s time I spoke up,” Mr. Takei came out publicly and blasted Schwarzenegger for his duplicity. Since then, he has been one of the most highly visible gay rights advocates in America. Despite his fame, Mr. Takei still struggles with the often demoralizing anti-immigrant and anti-LGBT+ sentiments that seem to be increasing since the election. In one of the most powerful moments of his speech, he urged his audience to never lose hope. “Sometimes I get tired,” he said, “but I don’t get disappointed.” Above all, he wants us to keep embracing and celebrating the infinite diversity in infinite combinations that can be found across America today—an honorable and timely lesson. Section Editor, Web Editor, and resident cat-lover at The Sandspur.